I have noticed that a lot of guitar players claim to be sick of playing the pentatonic scale as they have been playing it for years and want new scales to play. This is understandable – However, I think what guitar players especially need to realize is that there is so much more to the pentatonic scale when you simply use some imagination. Those of you that read my last article on modal pentatonics will realize how much can be done melodically by simply altering some of the notes in the formula. Today I want to look at using the traditional minor pentatonic in a non traditional way harmonically. 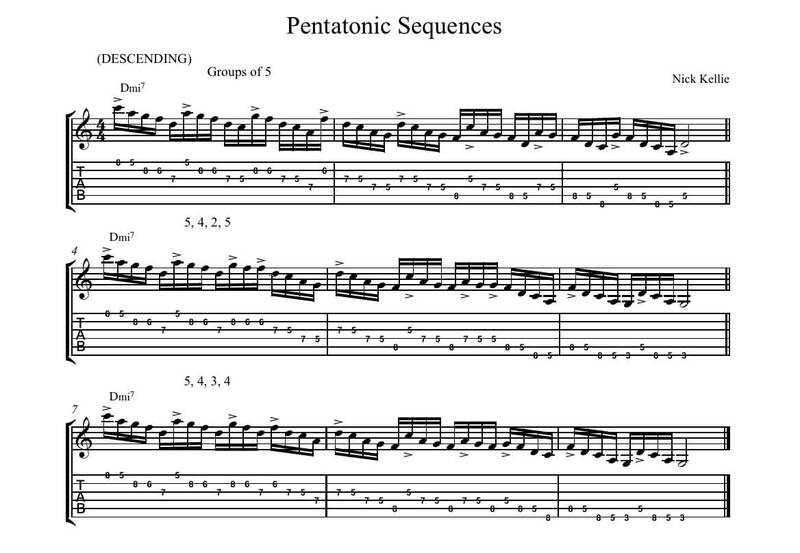 As well as the use of rhythm and sequences to break up the predicable nature of the pentatonic scale as we know it. First of all, I want to look at rhythm. 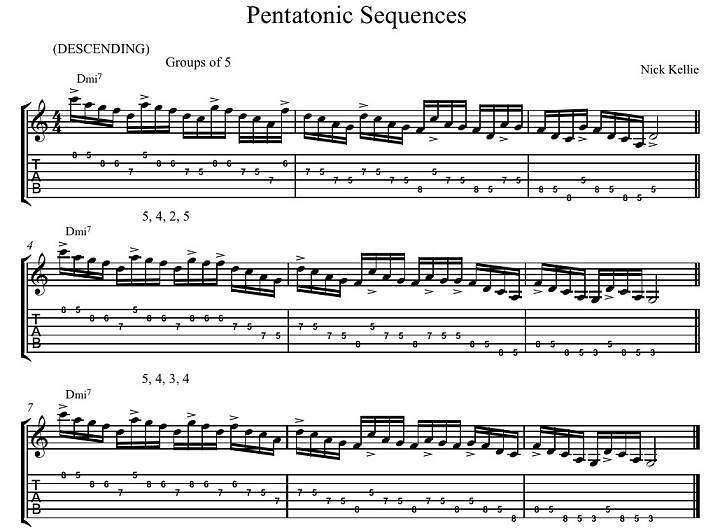 There are a number of ways we can vary the rhythm or melodic flow of a pentatonic scale. In this first example I want to look at a sequence that doesn’t so much alter the rhythm, but it alters the flow of the notes by using some interesting sequence patterns. Generally when playing scales, most of us sequence in 3s or 4s . I got the idea of sequencing in 5s from the great bass legend, Jaco Pastorius and the idea of blending 5s with other rhythms from the great guitar player Eric Johnson. The first 3 bars show you a D minor pentatonic scale sequence descending (going down) in groups of 5 - that is going down 5 notes, and then doing the same thing again starting from the 2nd note down the scale, then another 5 from the 3rd note down the scale and so on. The 3 bars after that we have a mixture of sequences – we have a 5,4,2,5 sequence, which means you go down 5, then starting from the 2nd note down go down 4. Then the 3rd note down the scale go down 2 and so on. You can make up your own sequence patterns, they are a real challenge to play but will really make your sequences unique sounding and bring a new freshness to your playing. Why does this work? What we are really seeing is a different mode of the pentatonic scale. All pentatonic scales come from a major scale. In this case, the chord we are playing over in the first bar is E half diminished (Em7b5) when we harmonize a major scale, we get 1 half diminished chord at the 7th degree of the scale, therefore, E is the 7th degree of the F major scale. When we harmonize the entire F major scale to 7th chords, we get the following chords: Fmaj7, Gm7, Am7, Bbmaj7, C7, Dm7, Em7b5 (E half diminished). This gives us a locrian sound when played over the Em7b5 chord. So to recap, The Fmajor scale contains the notes of an Em7b5 chord (E G Bb D) and the notes of an Am pent (A C D E G) so because they are both derived from the same key, they will work together. The notes of an F major scale are : F G A Bb C D E.
When playing the Am pentatonic over the Em7b5 chord, we are creating extra extensions over the chord, enhancing its sound. 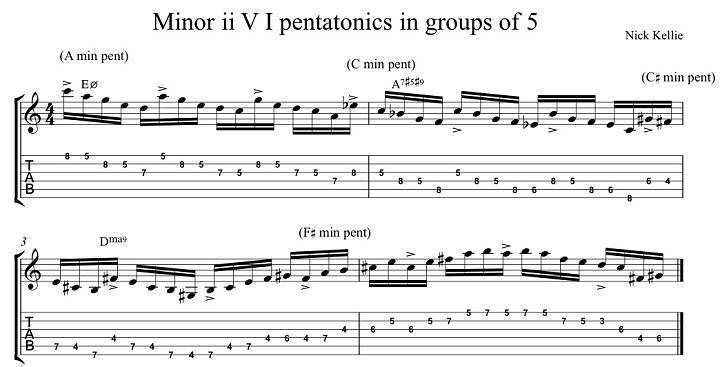 A real quick rule to figure out what min pentatonic to play over a Min7b5 chord is : Play min pentatonic from the 4th of the chord root. For example, if the chord is Cm7b5 – the 4th up from C is F so we would play Fm pentatonic over a Cm7b5 chord. Try it out, it’s a lot of fun! If we look at the next bar of that lick, we see a Cmin pentatonic being played over an A7#5#9 chord - This chord type is what we called an altered dominant. The quick rule for this chord type is: Play the minor pentatonic from the b3 of the root of the chord. For a Lydian Sound - Play minor pentatonic b2 down from the root of the chord (e.g. C#m pent over Dmaj9 chord). 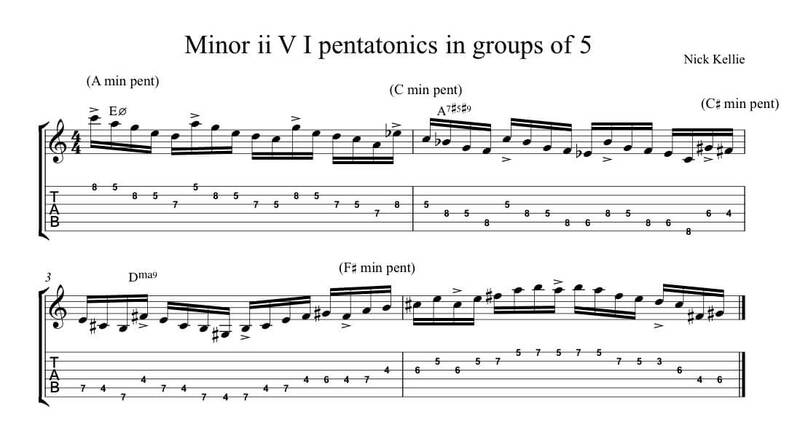 For Regular Major Scale Sound - Play minor pentatonic from 3rd of chord root (e.g. F#m pent over Dmaj9). One of my favorite pentatonic super impositions (not shown in the above example) is for regular dominant 7, 9, 11 or 13th chords. Here is the quick rule: Over Dominant chords play pentatonic scale up a 5th from the root of the chord (e.g. Em pentatonic over A7 chord). 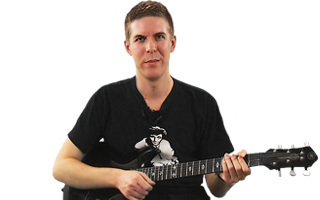 The same exact rule for dominants will also work on minor7, min9, min11, min13 chords. I really hope this gives you some fresh ideas and that you have fun implementing this. As always, Have fun!